In a free society each and every person lives under a rule of law, as opposed to a whim-ridden rule of men. Such a rule of law has only one purpose: to protect the rights of the smallest minority that has ever existed — the individual. Rules and laws serve many purposes necessary for a thriving society, including the punishment of wrongdoers, the resolution of disputes, the promotion of the common good and moral habituation. If any organisation has rules and regulations that are kept secret from their members, they are considered to be unfair. They are unfair because one cannot adequately defend themselves when they are not privy to such rules. Unfair procedures are wrong and illegal. The Bible – Open or Secretive? When Moses established laws for the Israelites, he put the 10 fundamental laws, known as the 10 commandments, on stone tablets. He published those commandments along with some 600 additional laws in books that now make up part of the Bible. The Israelites were commanded to read and understand those laws and follow them. There would be repercussions for laws that were broken. The Israelites were made aware of all the laws of Moses. These laws came to be known, collectively, as the Mosaic Law. Not one law was kept secret from any Israelite. When the first century Christians were becoming established, they were primarily following Jesus’ example of love. However, matters cropped up that needed to be dealt with and principles needed to be followed. Paul and others wrote to the congregations back then and based their decisions on principles established in the Mosaic Law. As the congregations had both the writings of the apostles, Paul and others, they knew how to be a Christian. No law or principle was kept secret from the early Christians. There is no historical evidence to suggest that the Israelites or early Christians had any secret laws, policies or procedures. All members – men, women and children – were privy to the laws. 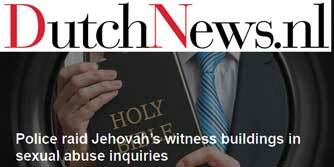 Do Jehovah’s Witnesses have rules and regulations that most members are not privy to? Indeed they do. 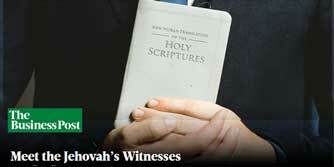 I know not of any religion as secretive as Jehovah’s Witnesses when it comes to their rules and regulations. Here are a list of rules and regulations that only congregation elders are privy to. No female Jehovah’s Witness is privy to any of these rules. Having such secretive rules and policies is evidence of a complete lack of respect for members generally, and women in particular. Some may argue that not all members need to be privy to some of the above procedures and policies. That may be the case but is there really any harm if all members are aware of the above procedures and policies? Why all the secrecy? And particularly, why so much secrecy surrounding the judicial process? Considering the fact that decisions made in a judicial meeting can have a detrimental impact on a person, isn’t this an area that should be completely transparent? In cases where Jehovah’s Witness elders have never experienced shunning personally, they are quicker to mete out disfellowshipping as a form of punishment for wrongdoing than consider the alternatives as a first step. In most cases where person feels that they personally are repentant for their wrongdoing, are confused, frustrated and distressed when the decision by elders is to disfellowship. This is exacerbated when the person appeals the decision only to find that the appeal committee uphold the original decision. The alleged wrongdoer is not informed that the appeal committee privately consult with the original committee on the case prior to and following the appeal meeting. The alleged wrongdoer is provided with no further recourse than to accept the decision and receive the judgement: shunning for an indefinite period of time. Individuals who have been treated unfairly in Jehovah’s Witnesses’ judicial meetings have, in many cases, taken the extreme action of suicide. Others have seriously harmed themselves to the point where they have a substantially reduced quality of life. Such secretive rules and policies are unfair, wrong and illegal. And worse, when Jehovah’s Witness Judicial Committee decisions are made, they have no process to right their wrongs. If the Jehovah’s Witnesses are allowed to continue using their unfair procedures, more people – adults and children – will be harmed and some will commit suicide. While Jehovah’s Witnesses have secret rules and policies, their duty of care to their members, including children, is greatly diminished. Jehovah’s Witnesses believe that being a religious organisation, they do not have to use fair procedures. However, as a religion based on Biblical values, it must accept that that the laws and regulations covering the Jews and Christians were clear and transparent. If Jehovah’s Witnesses truly believe that they are “God’s Organisation”, surely they should be as clear and transparent as the good book that they believe He provided to humanity as a guide to everyday living. And surely, they do not want to be associated with some of the secret societies they mention in this article!